Where Did the Dollar Sign '$' Come From? We got the $ from the Spanish. In the late 18th century, merchants in the North American British colonies traded mainly with two currencies: the British pound and the Spanish dollar. When the United States adopted its own currency in 1785, it used Spanish money as its model--a deliberate "screw you" to the British. 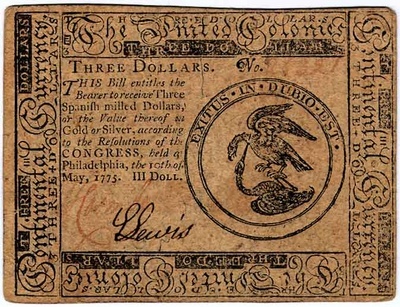 Scholars have since theorized that the $ sign evolved out of an abbreviation for peso: The plural for pesos was "ps," which eventually became "ps," and then simply an "S" with a single stroke denoting the "p." One early instance of the $ symbol crops up in a letter written by the merchant Oliver Pollock in 1778. Pollock also uses the "ps" abbreviation, making the letter a bridge between the two. The double-line through the S variation is less easily explained. Some believe they represent the twin pillars of Gibraltar depicted on the Spanish coat of arms. Others say it's shorthand for the letter "U" superimposed over the letter "S"--for U.S. The British pound symbol - £ - comes from the Latin word libra, meaning scales. Originally, one pound was worth exactly one pound of silver, and scales were necessary for exact exchanges. The Chinese yuan uses ¥, which is apparently a messily transliterated "y." Some sad countries like Germany and Poland don't have currency symbols. Read the whole story at Slate.